Today I was interviewed by Sarah (right) and Michaela (left) for ABC’s Behind the News. Sarah and Michaela attend Bell Primary School in Melbourne, the first school to be involved in the Befriend a Child in Detention project established by Dr June Factor. The aim of Befriend a Child in Detention is to make others aware of the children locked up in these centres not only on Nauru but also here on the mainland. Hopefully this practice will end soon for children do not belong behind barbed wire. 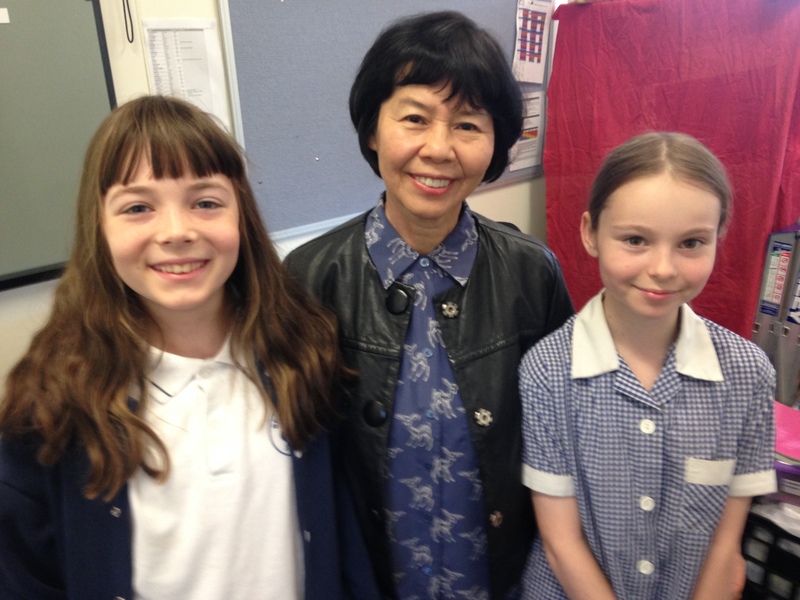 Sarah and Michaela were among the many students who wrote letters to children in detention on Nauru. These letters were then sent to Befriend a Child in Detention and each one was carefully placed inside a book. There have been many generous donations of books from publishers, supporters of the project, children’s authors and bookshops. Four boxes of beautiful children’s books, each with a letter of greeting and many with stamped addressed envelopes were sent off. It was a nervous time while we waited for news of the shipment’s arrival. And then the email came. What a joyful day that was. And then the Assistant Principal of Bell Primary told me that some students had received letters back! Michaela was one who got a reply. I had no words. I could not even imagine how those children would have felt hearing from children in Australia, knowing that they had not been forgotten. Recently another shipment of books and letters have been sent off to Nauru. The students at Bell Primary have written back to the children who wrote to them. Hopefully we will hear of their safe arrival soon. If you would like to know more about Befriend a Child in Detention and what you can do please visit their website.